Rebecca Barnette, a self-described homemaker from Surgoinsville, Tenn., is a leading activist of the White Lives Matter movement. Now comes White Lives Matter (WLM), a small but virulent movement that goes far beyond anything Christie or anyone in the conservative mainstream has said. Its main activists, to put it plainly, are unvarnished white supremacists. Emanating from the fever swamps of the radical right, it’s somewhat difficult to trace WLM’s precise evolution and leadership structure. But it’s clear that one of its key leaders, if not the leader, is 40-year-old Rebecca Barnette (or Rebekha, as she sometimes spells it online), a Tennessean who is also vice president of the women’s division of the racist skinhead group Aryan Strikeforce. In June, Barnette announced that she also had been appointed director of the women’s division of the National Socialist Movement, America’s largest neo-Nazi group. Barnette, who describes herself as a “revolutionist” who is working to “create a new world” for white people, appears to run both the WLM website and the movement’s Facebook page. But Barnette can sound considerably more bloodthirsty. The WLM website urges activists to grow the movement, much as white supremacists in the last several years have worked to seed the idea in the political mainstream that white people are being subjected to genocide. The site asks supporters to find “like-minded people” and organize groups to attend school board and local town council meetings, arrange neighborhood block parties “to discuss the problems affecting our community,” and to “find out who your local state rep is” in order to confront them about issues of illegal immigration and healthcare. There are signs that some of this is happening. 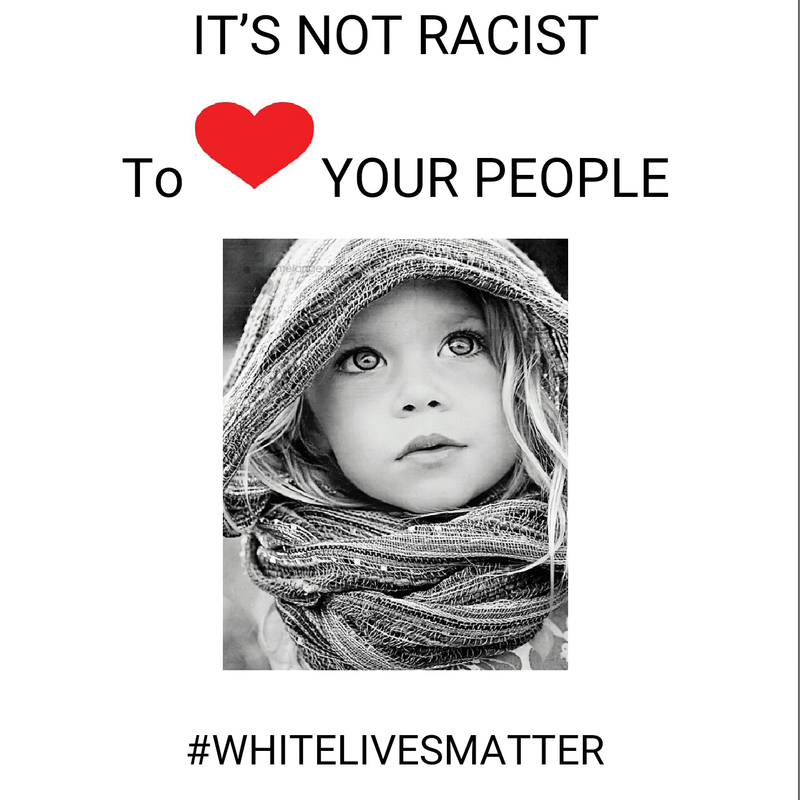 Since last year, WLM flyers, reading “It’s Not Racist to Love Your People” and carrying the hashtag #whitelivesmatter, have been posted on bathroom walls, light posts and bus stops from Utah to Connecticut. Some incorporate language about black-on-white crime, a reminder of the racist Council of Conservative Citizens website that dwells on the same topic and inspired the racist massacre last year of nine black churchgoers by Dylann Roof in Charleston, S.C.
Melissa Dennis, a California woman who is a contact for the racist Noble Breed Kindred group, designs and sells WLM T-shirts and stickers to raise funds for racist groups. She joined a “flyer drop” where activists distributed WLM propaganda on Jan. 9 as part of what was billed as a national anti-Muslim event. On the same day, Billy Roper, a well-known racist leader, pasted up flyers in Harrison, Ark. 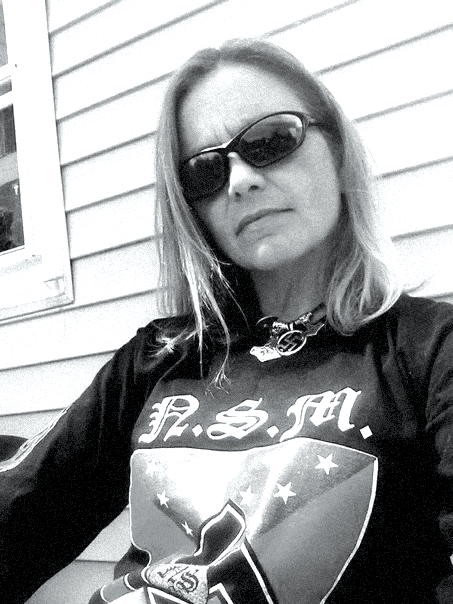 Dennis also offered WLM T-shirts for an Aryan Nationalist Alliance meeting on June 25, held in Salem, Ohio, according to comments on her vk.com page. A neo-Nazi group, the Texas-based Aryan Renaissance Society (ARS) of which Barnette was once a part, has described itself as “the leading force behind the WLM Movement.” The ARS has distributed WLM flyers in southeast Texas and once held up WLM signs as a procession passed for a memorial service for Harris County Deputy Darren Goforth, who was murdered in August 2015. ARS member Doug Chism of Texas City has a large WLM sign erected outside his home. The ARS describes itself as a “network of dedicated White Separatists diligently striving to impart a New Racial Consciousness to Aryankind.” It hopes to create “an Aryan oligarchy based on genetic aristocracy” to “enhance the Race.” The overall idea, ARS says, is to protect threatened white people from genocide and the “bastardization of the white race” through interbreeding. One of the more noticeable appearances of the WLM movement came on Feb. 27, when a car containing six Klansmen and bearing “White Lives Matter” signs arrived at a park in Anaheim, Calif., to protest “illegal immigration and Muslims.” Counter-protesters set upon the Klansmen, who stabbed three people, one critically, in response. Although police initially arrested five Klan members, they later released them after saying the stabbings were self-defense and arrested several protesters. It’s unclear how much the WLM movement matters in the real world, beyond annoying most of those who see its flyers and other propaganda. But WLM activists are hard at work, doing their best to seed yet another racist concept into the consciousness of American whites as they seek to build a whites-only nation. Given the atmosphere in the United States today, that should worry all Americans. For SPLC's statement on why Black Lives Matter is not a hate group, please visit this link.